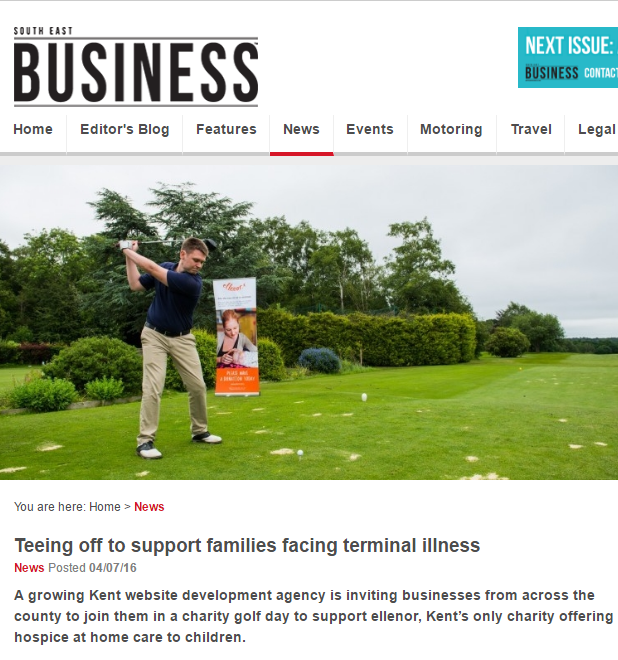 We’re delighted to be backing Kent award-winning website agency Larrytech as they stage their first charity Golf day. They’re supporting the wonderful organisation ellenor, Kent’s only charity offering hospice at home care to children. It’s a coming of age for Larrytech, which provides website design and search engine optimisation for a growing range of clients across all sectors. They celebrated their 15th birthday in April. Shortly afterwards they were named Creative Business of the Year in the inaugural Royal Tunbridge Wells Business Awards. And now they’re pulling out the stops to give back to their local community with the charity event at the Nevill Golf Club, Tunbridge Wells, on 16th September. “We’re a local business, with many of our team educated in the West Kent area, so we thought this would be a fantastic way to give back to our local community. It also gives other businesses in the county the chance to come and support ellenor while building relationships with like-minded professionals in a relaxed, fun environment,” said director Larry Hardcastle. Our role in this is to help with public relations. We’re delighted to have got them coverage in a range of local newspapers and magazines. We’re also pleased to be able to do our bit to support ellenor in its wonderful work helping families facing terminal illness across Kent. Director of fundraising for ellenor, Rachel Holweger, commented: “We are delighted that Larrytech have chosen ellenor as the charity they want to support with their golf day. One child or young person is newly referred into our children’s service every single week and we know there are other families we could be helping too – so fundraisers such as this are vital. 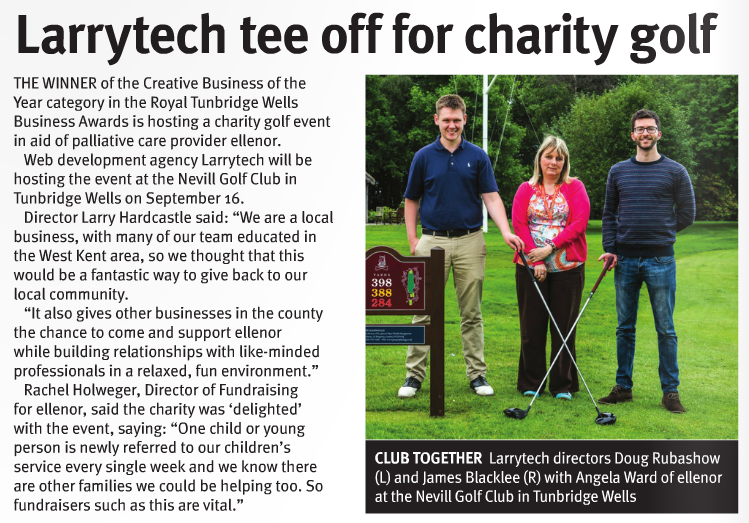 Larrytech is an exciting, dynamic, young team of local talent and it’s great that they have chosen a local charity that has such a positive impact supporting families across the county – and that they’re inviting other businesses from Tunbridge Wells and beyond to join them.” A team of four entering the Larrytech Golf Day would provide three sessions of chemotherapy in the home for one of ellenor’s young patients. The Larrytech Charity Golf Day will include pre-golf bacon butties, refreshments and an evening meal. Tickets are £60 each and are available from www.charity.larrytech.com/golf/.